Adrien “The Problem” Broner, left, talks with Simon Ruvalcaba before the bout with Manny Pacquiao. Anyone not touched at the prefight profile of Plant and how losing his 17-month old daughter a few years ago. Also congrats to Caleb and his now fiancee Jordan Hardy. They have been a known boxing couple, with Plant being the fighter and Hardy a backstage reporter for Fox Sports and PBC. Plant proposed to her in the locker room after the bout, so he had two victories Sunday evening! With Plant’s feel good story past, the boxing world is now looking forward to Saturday’s first PPV of the year when the legend Manny Pacquiao returns to Las Vegas to face Adrien “The Problem” Broner. 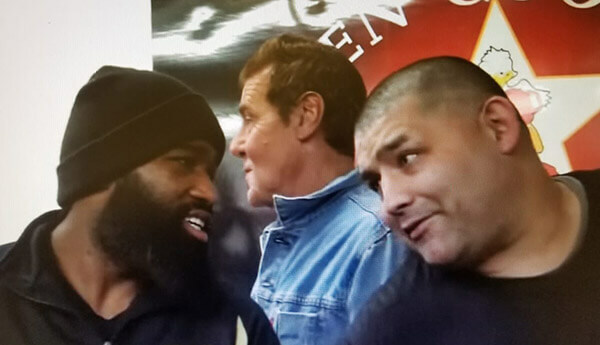 I was at Broner’s media day at Ten Goose Boxing Gym last week and he appeared both confident and ready. I am sticking with my prediction of Manny by close decision. But no outcome would surprise me and even a draw is very likely in this one as Manny is traditionally a fast starter and, lately, Broner has finished strong. If there is a knockout in this one, I think the better odds should be on Broner to use his quick counters. I would be more surprised if Manny knocked out Broner. The expectation is that a Pacquiao victory would open the floodgates for a Mayweather rematch. With Manny now under the Al Haymon banner, the bout would be a lot easier to make then it was for the first bout. That match took years to come to fruition. The UFC has a new home and looks to hit more mainstream on ESPN. After a 9-year run on Fox, which allowed UFC to grow, it now steps up to big-time exposure. What a bout to kick off the new partnership:Saturday on ESPN+ Bantamweight Champion TJ Dillashaw, a friend of the podcast that I book guests for (The Punchline with Kelly Pavlik and James Dominguez), goes down in weight to challenge for the flyweight title against Henry Cejudo in what should be an explosive match up. The UFC card also has some regional flavor, as Paige VanZant, my former fighter out of the Lion’s Den Reno — now training once again in Oregon — returns to the cage against Rachel Ostovich in a women’s flyweight bout. Let’s hope that the action launches both boxing and MMA to a successful year under the combat sports tent. For all of the back-and-forth between the fans, what fails to be realized is the respect that these athletes have for their fellow competitors. There is plenty of room for both sports to prosper, and fans can enjoy all the action.